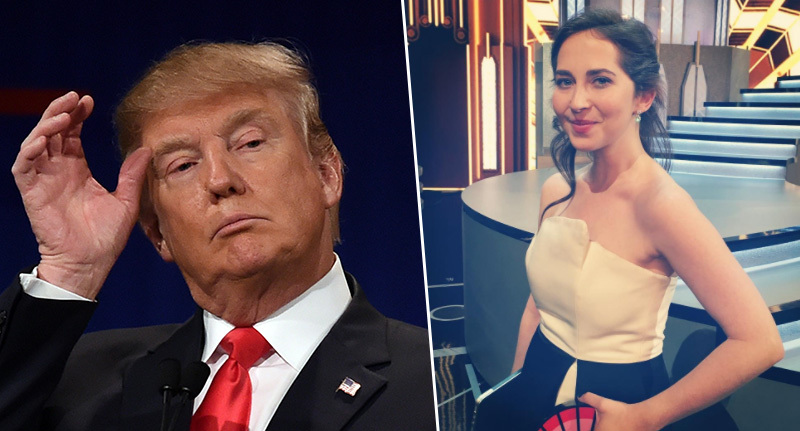 Donald Trump showed himself up as the one true ‘Snowlflake’ after blocking comedy writer Bess Kalb on Twitter after she ‘hurt his feelings’. Kalb, who has won awards for a her writing for Jimmy Kimmel Live as well as the Oscars, was taking the piss out of the billionaire politician when he took the ultimate social media revenge. Like a school kid who can dish it out and not take it, Trump blocked Kalb after she highlighted the list of embarrassing acts he carried out on his trips to Saudi Arabia, the Vatican, and of course that shameful pushing to be at the front. I know you’re trying to pivot away from how embarrassing the big trip was for all of us to watch (Pushing! Pope! Saudi bowing!) but…this? Honestly, hun this is all so far over your head. If you need to have another ‘bone spur’ and let Mike take over, no one will blame you. From now on, there is only one Snowflake. Kalb described it as ‘the straw the broke the camel’s back’, and couldn’t believe the POTUS blocked her, summarising her feelings towards it with the feminist statue of a girl opposite a bull that stands on Wall Street. Bess was mortified yet unsurprised that ‘the leader of the free world could be so wounded by the gentle ribbing of a comedy writer’. It is mortifying, yet unsurprising to me that the leader of the free world could be so wounded by the gentle ribbing of a comedy writer. With the special prosecutor investigating Trump, the odds that he will be impeached are sky-rocketing. And if I could talk to him now I'd tell him: "Donald, sticks and stones may break your bones but articles of impeachment will harm you." Bess joked that this personal move towards her lost her vote for him. And, honestly, he just lost my vote. Ouch she brought up the dubious ‘bone spurs’ which prevented Trump from being drafted in the Vietnam War in the 60s. Today our president took more time to address a girl making fun of him on Twitter than the domestic terrorist who fatally stabbed 2 heroes. After all the attention that the hilarious write received, she released an ‘official statement’ through her Instagram which was titled ‘No mother should have to explain the President blocking her to her garbage sons’. The video was her ranting about the Twitter incident to her two sleeping cats who couldn’t give fewer shits about the situation. When will Trump learn he can’t just build walls (physical and on the Internet), and make problems disappear.